Top quality Norwegian salmon flies in Finnair’s cargo hold to Japan. 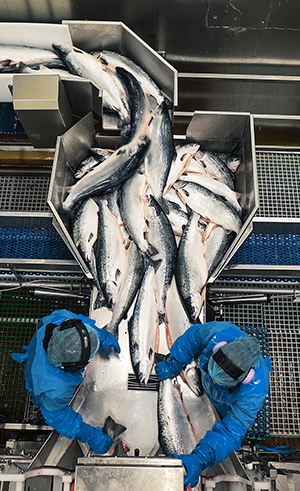 Blue Wings follows their journey from salmon farm to sushi restaurant. I’m sitting in the Choushimaru sushi restaurant in Chiba, just outside Tokyo. I’ve reached the end of a journey in pursuit of the sliver of raw salmon glistening on rice before me. 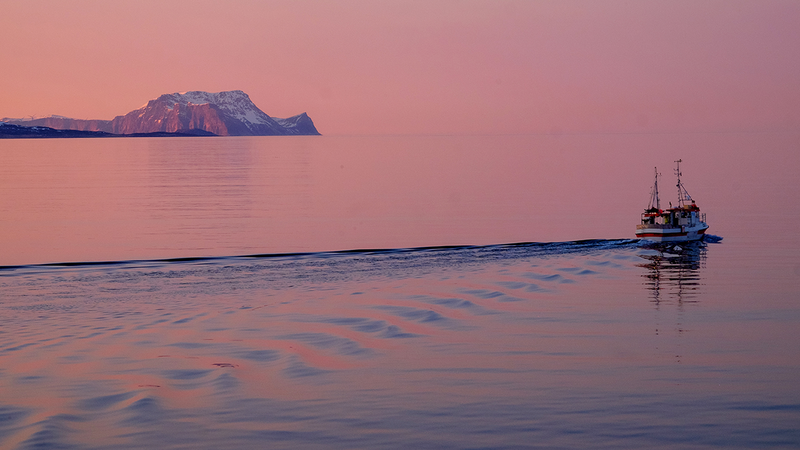 I think back to the beginning of my quest, in a fjord just west of Tromsø with the snow-specked Norwegian mountains reflected in a breezeless sea. My voyage starts with a 30-minute motorboat ride to the end of the fjord in the company of Håvard Hårstad and Renate Larsen, respectively production manager and managing director of the Lerøy Aurora seafood company. I see silver darts shoot out of the water within the giant hoops marking the enclosures. This is my first sighting of the Norwegian salmon, whose numbers in this fish farm, Hårstad assures me, total around 1.86 million. Less than 2.5 per cent of the Aurora farm enclosures is occupied by salmon. The giant hoops on the water’s surface are actually the uppermost rims of 55-metre-deep cages, and regulations require no more than 2.5 per cent of their volume to be occupied by fish. “We give them even more space than that,” says Hårstad. Lerøy is also one of the few Norwegian producers at present that can meet strict ASC (Aquaculture Stewardship Council) environmental certification for salmon farming, he adds. Salmon are processed at Lerøy’s fish farm at Skjervøy in northern Norway. I then hop aboard Norway’s coastal ferry, the Hurtigruten, for a four-hour voyage north to the small town of Skjervøy, the site of Lerøy’s fish farm. The site manager keeps his promise of a drive into the mountains and a viewing of the phenomenon that gives the salmon brand its name: the Aurora Borealis. The salmon follow me the next day in a state-of-the-art ‘well boat’, a special vessel containing vast fish tanks. The fish are directed into the tanks through wide pipes that are also used to transfer them into enclosures at Skjervøy’s quayside. The workflow is designed to cause the salmon as little stress as possible. Inside the factory, I don rubber boots, head cap, and a disposable gown. Then I watch a procession of salmon launch through the different stages of processing. The fish are quickly stunned before being slaughtered, then graded and gutted. Some of the fish are filleted, others dispatched whole. At the transport bay a Finnish truck driver watches with me as the polystyrene boxes are lifted into the refrigerated container. The drive passes through Norway and Sweden to the Finnish border to Oulu where another driver takes the wheel. From there the road trip to Helsinki Airport is completed, and the salmon boxes packed onto pallets and loaded into the Finnair cargo holds of a scheduled Finnair flight bound for Tokyo. Less than 36 hours after swimming off the Norwegian coast, the salmon are unloaded near Narita airport. Sitting on the flight to Tokyo, I wonder if the other passengers realise they are sitting above several tonnes of top quality salmon, Finnair’s most voluminous cargo from Finland to Japan. We arrive at Tokyo’s Narita Airport in the morning and Koki Yotsui of Lerøy Japan is there to take me to the nearby Nippon Express perishable storage terminal. An hour or so later, the truck from the airport arrives carrying two pallets piled high with boxes of salmon. Less than 36 hours earlier the fish were swimming in the Norwegian fjords. Tokyo’s sprawling Tsukiji Fish Market. My next appointment with the salmon is at 4 am the next morning at the famous Tsukiji Fish Market. The salmon, sold under the Aurora name, is transported to storage where the first buyers have arrived. “Japanese people can tell the difference between deep frozen salmon and salmon that’s fresh,” explains Koki of Lerøy Japan. “But traditionally sushi has been considered as affordable food and Aurora is a high-end brand. We’re focusing on freshness and quality, so the more discerning customers enjoy it,” he says. Finally, ready to eat: Aurora sushi at the Choushimaru sushi restaurant in Tokyo. This article is published in the November 2015 issue of Blue Wings.